This single line will contain this article’s sole mention of Dylan McDermott. While the satisfyingly similar names and handsome-guy faces of that actor and Dermot Mulroney have made for some great comedic fodder over the years—notably in this Saturday Night Live sketch and culminating last year in a joint appearance on the former’s Fox series L.A. To Vegas—Mulroney is his own man, with his own talents, his own relationships, his own projects, and his own opinion on whether or not a hot dog is a sandwich. Julia Roberts: Did everybody get that? Dermot Mulroney: Did you get all that about how grateful I am to have a buddy like Jules and to get these great scenes? ... Incredible experiences I’ve had with her. If their work together in those two previous projects is any indication, both Mulroney and Roberts will be great in this series, trading on all that comfort together, the affability, the honesty. Mulroney is the kind of actor who has an abundance of those particular qualities at his disposal. 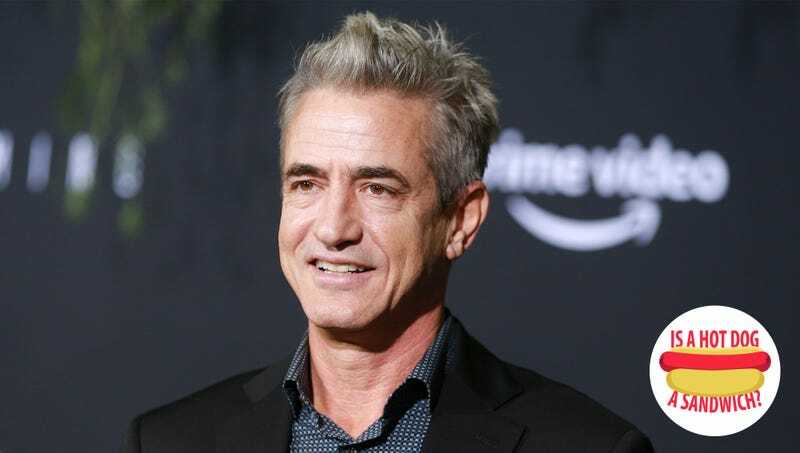 Dermot Mulroney: [pause] Yes, it is. Now you’re going to ask me why, aren’t you? DM: And what did he say? Because I agree with Bobby. TO: He said it’s not a sandwich. DM: It’s not a sandwich. Hmmm. Maybe it’s... [sigh] God, I don’t know, I don’t know. Is it? I’m going to have to recuse myself, I don’t know. Is it? TO: I can’t tell you that, I don’t have a dog in this hunt. TO: Well, your gut instinct was yes? TO: I think that’s perfectly sound. Amazon’s series adaptation of Homecoming, starring Julia Roberts, Stephan James, Mulroney, Bobby Cannavale, and others premieres Friday, November 2.